THE fight to protect the South-East’s crucial aquifers and “clean, green” reputation has turned physical, following the first flaring of gas from a controversial well near Penola. Beach Energy last week tested its Haselgrove-3 conventional gas well, 8km south of the town, after it discovered what could be a “large gas resource” in January. 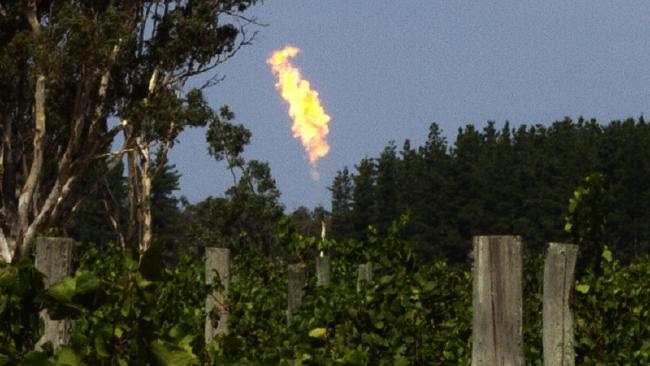 The flaring reignited a fight by the Limestone Coast Protection Alliance to protect the region from all forms of gas exploration and development, and in the case of one community member, the metaphorical fight became literal. Police have reported a Limestone Coast man, 32, for aggravated assault and trespass during a protest by the Alliance outside the site, on February 14. The man, one of 30 people protesting, allegedly assaulted a security guard employed by Beach Energy, and will appear in court at a later date. The Alliance has distanced itself from the protester, saying he was not a member of the group, but it shows the depth of feeling about the issue in the local community. 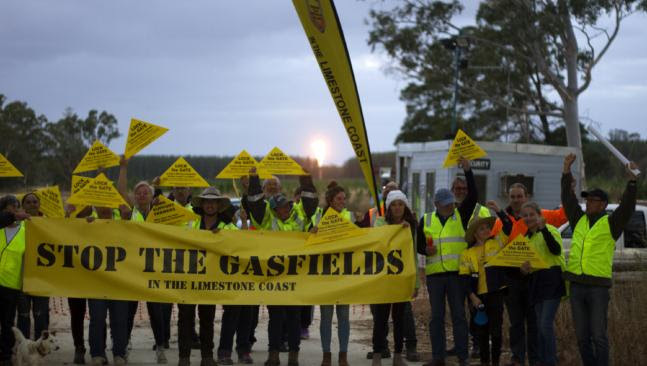 The Alliance is calling for a ban on all gas exploration and development in the Limestone Coast. “With the state election looming we are calling on all candidates to listen to the community and commit to a ban on all gas exploration and development in the Limestone Coast and Otway Basin,” Alliance co-chairman Brett Mashado said. The group is concerned drilling will contaminate and deplete aquifers and the region’s reputation as a clean and green producer of food and wine would be destroyed. The South-East has a burgeoning wine industry and its agricultural production was worth $3.2 billion in 2015/16, or 51 per cent of the state’s total, an ABARES report shows . “If there was just one message I could convey to South Australians . . . it would be ‘your food comes from this region – please help us protect it’,” Mr Mashado said. But Beach Energy says drilling is safe, with underground water resources protected by layers of steel and cement casing installed during drilling, which protect major groundwater aquifers from the possibility of hydrocarbon leaks. The aquifers extend 300m below the surface, while the protective casing would be installed to about 900m, to provide added levels of protection, the company said. The target for Haselgrove-3 lies more than 4km below the surface. But Beach’s statements have done little to allay fears. Limestone Coast Grape and Wine Council chairman Pete Bissell believed exploration would ruin the region’s clean environment, which was vital to the quality wines produced. Mr Bissell said Chinese customers had clearly communicated the value they placed on the health of our environment and our production regulations in Australia. “Gas exploration and production in our geology poses unacceptable risks to our ongoing sustainable businesses,” he said. 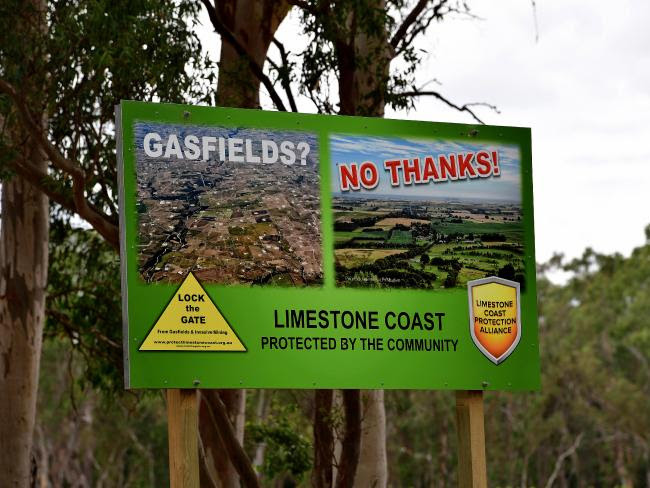 But Wattle Range Mayor Peter Gandolfi said the local council was not opposed to conventional gas extraction, as it had occurred in the region for decades. There are 84 petroleum wells drilled, to date, in the onshore Otway Basin, according to government figures. Mr Gandolfi said thousands of jobs and livelihoods relied on the region’s industries that use gas and the security of energy supply was very important. “We have the largest gas consumer in the Limestone Coast, being Kimberly-Clark, which directly employs approximately 400 locals and contributes more than $50 million to our local economy,” he said. Despite controversy on the possible use of fracture stimulation in oil and gas drilling, the Haselgrove-3 well was drilled using conventional gas exploration techniques. Beach Energy says it has no plans for anything but conventional drilling in the region. However, SA Best leader Nick Xenophon this week at the Leaders’ environmental debate matched the Liberal Party policy of a 10-year moratorium on fracking in the South-East. The Liberal policy was pushed for by former Liberal, now independent MP Troy Bell, and the party has said it would be retained. Mount Gambier’s sitting member Mr Bell is facing 26 criminal charges but looked likely to be re-elected, and said he would only deal with a government that supported a fracking ban. “Just this week we saw a protester get arrested – that’s the level of feeling down here, it’s such an emotive topic for people,” he said. “But there’s one party that doesn’t seem to get it, who are out of touch and not listening to the South-East. The Labor Government was openly in favour of unconventional exploration and has warned a ban would drive up energy prices, hurt businesses and cost jobs. “High power prices also make local industry in the South-East less viable, such as Kimberly-Clark, hurting local jobs,” Energy Minister Tom Koutsantonis said. The Government this month committed $1 million towards a CSIRO study into the social and environmental impact of the gas industry in the Otway Basin. Mr Koutsantonis said water quality and the socio-economic impacts of the industry on neighbouring primary industries would be addressed in the research project, expected to take three years. Agricultural advocate and member of the Government’s Roundtable for Oil and Gas Projects, Anne Daw, said conventional gas exploration posed the same risks as unconventional techniques. “Their biggest issue is corrosion of cement and steel used for the wells mainly caused by hydrogen sulphide and anaerobic bacteria,” Ms Daw said. “It is not only a question of integrity of any well during production but also when the wells are decommissioned and the companies are long gone. She said the Government’s plan for landowners to get 10 per cent of royalties if gas was sold from their land was also flawed and the project had created a divide in the once “harmonious” town of Penola. It followed Beach Energy giving financial “gifts” to the community and receiving a $6 million government PACE grant to partly-fund its drill at the Haselgrove-3 site in January. Beach Energy has rejected Ms Daw’s claims they had created a divide and said they had staff living in Penola and the community had been very supportive. “Beach is a proud member of the Penola community and surrounding region and we are appreciative of the support we have received,” a spokesman said. Oil and gas industry peak body APPEA SA director Matthew Doman said the gas industry has a strong safety and environmental record in SA and they were determined to maintain it. “The integrity of our wells are among our highest priorities, they do not corrode, neither the cement or steel and it’s very important we take all measures to prevent this,” Mr Doman said. “Rather than scaremongering it’s better to look at the track record of our industry. “There is no demonstrated evidence of these claims.